ST. GEORGE — One man was sent to the hospital Thursday evening after a crash in downtown St. George. 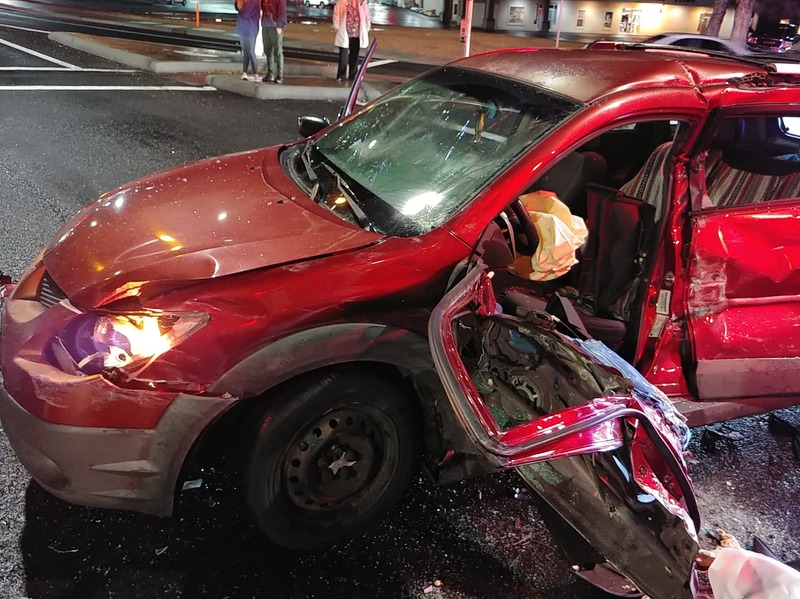 Emergency personnel responded to the two-vehicle T-bone crash involving a Jeep and a red passenger car at the intersection of Bluff Street and St. George Boulevard at 7:47 p.m. The male driver of the passenger car was injured after the vehicle was hit on the driver’s side. He was transported by a Gold Cross Ambulance crew to Dixie Regional Medical Center. No other injuries were reported. St. George Police Sgt. Jeremy Needles said officers were still investigating the exact cause of the collision. The wrecked vehicles came to rest in the middle of the intersection and were blocking several lanes of traffic. Responders closed the outside northbound lane on Bluff Street, both eastbound lanes on St. George Boulevard and the left-turn and inside westbound lanes on St. George Boulevard. Firemen from St. George Fire Department assisted wreckers in cleaning up the crash. They had the entire scene cleared within about 30 minutes of the initial call. The new and ‘improved’ intersection of Bluff and Sunset is a mess in need of better signs and lanes painted with directional arrows. While the paint truck is out most if not all roads could use a new coat of reflective paint and make them wider as well. Simple improvements for better flow and safety. I agree. More clearly defined arrows and lanes to make it easier for drivers to discern the bobs and weaves the roads take. I just hope all these people that need signs, arrows, lanes , reflective paint, etc, don’t drive a boat or fly an airplane!